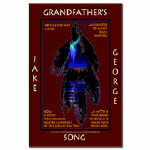 Welcome to Grandfather's Song, the book is available from Archebooks Publishing. Books can also be ordered from Amazon or Barnes & Noble. The book may also be ordered from a bookstore near you if they do not have it in stock. I am happy to announce that a new book store is opening in Creve Coeur, Missouri. All On the Same Page" bookstore. They will have their grand opening on 1 Oct 11. They will be carrying my books. Let's wish them well. The world needs more book stores. Other books by Jake George, A New Dawn, Good Night My Sweet Baboo, and Graves' Disease In Our Own Words. 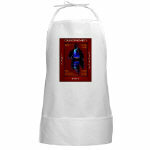 An authentic Native American voice relates stories of modern reservation life blended with ancient Lenape tribal lore. Take a read: you’ll find yourself seated in tribal councils and conducted on vision quests into the farthest reaches of the universe. You’ll watch the animals turn human and tell their tales and finally you may come to understand and respect the vitality of a culture which seeks balance in all things. Jake George is a writer who deserves the same attention and respect earned by such fine novelists as Sherman Alexie and Tony Hillerman. Sara Williams Archebooks’ best-selling author of The Don Juan Con and The Serenoa Scandal. 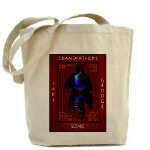 Grandfather’s Song opens a window to a Native American’s mind. It draws in the reader forcing him to suspend reality as other worlds appear. One is a hidden, mystical world a world where the smoke of a pipe may reveal shape shifters, ancient rituals, giants or visions of things to come; a world where death and life entwine as the Great Creator intended; a world entered only at great personal risk but avoided at even greater risk to all humankind. Other worlds appear-new worlds and old: worlds of contemporary Indian life. Here too, reality may be as fleeting as a wisp of smoke, but the emotions are solid-sometimes wrenching-sometimes gentle-but always genuine. 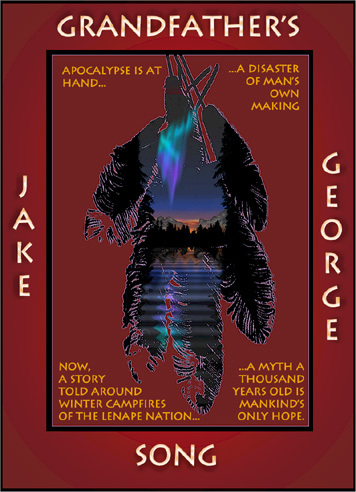 Jake George, who is himself part Indian (Lenape), sees with the eagle’s eye and tells his story with the shaman’s voice. Give ear to his Grandfather’s Song. If your goal is to read a book that transports you into a different world unlike any that you've read or seen before, then Jake George's Grandfather's Song is a must-read. Fantastic, authentic, thought-provoking, this book pulses with true Native American vision. 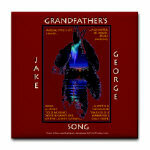 Many people can write a book, but few can tell a story in the old way like Jake George does in "Grandfather's Song." A Native American tale, "Grandfather's Song" offers a fresh new voice to fans of well-told stories and Native Legends brought to life. Thank you, Jake, for the wonderful read. I would highly recommend this book, and hope more works are forthcoming. 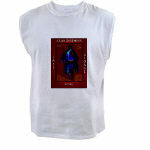 If you love the book cover then you will love the Grandfather's Song gift shop. 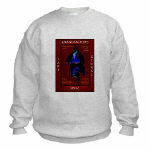 The cover is put onto a number of different mediums by the artist for your pleasure. We have a link to Julie's Web Site at the bottom of this page. The Hardcover ISBN is 1-59507-069-9 $25.99 when ordered from your local book store, or at a reduced price of $20.79 if ordered directly from the publisher. The E-Book ISBN is 1-59507-070-2. $3.99 for the e-book version of the novel and that can be downloaded today and put on a disk for gift giving. Requests for autographs can be sent to the address below. Please send a self addressed stamped envelope with enough postage to cover the return of the book. Or you may send a SASE envelope and I will send you a signed lable that can be put in the book or the Jewel cover of the e-book as well as a "Grandfather's Song bookmark. Grandfather's Song is being represented by Barbara Casey Literary Agency. 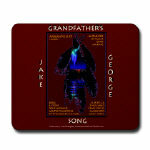 Art From The Soul designed the book cover for Grandfather's Song as well as the lightning image above. Please visit Julie's site for some truly amazing artwork. I am proud to call her a friend and am very happy she honored me by doing my cover's artwork. Wanishi, (Thank you) and Grandfather's Blessings. Copyright © 2004, Jake George, All Rights Reserved.